Enviro-PROFIT is TAX-EXEMPT FINANCING of Anti-Pesticide and Environmental Terrorist Organizations in Canada, such as David Suzuki Foundation. Suzuki is a FUND-RAISING, PROFIT-SEEKING, and LOBBYING organization, but it is NOT a science, research, or health organization. Suzuki’s donation money DOES NOT GO INTO RESEARCH, but goes to paying for Enviro-Lunatic Hired-Guns or Lobbyists, and clerical employees. 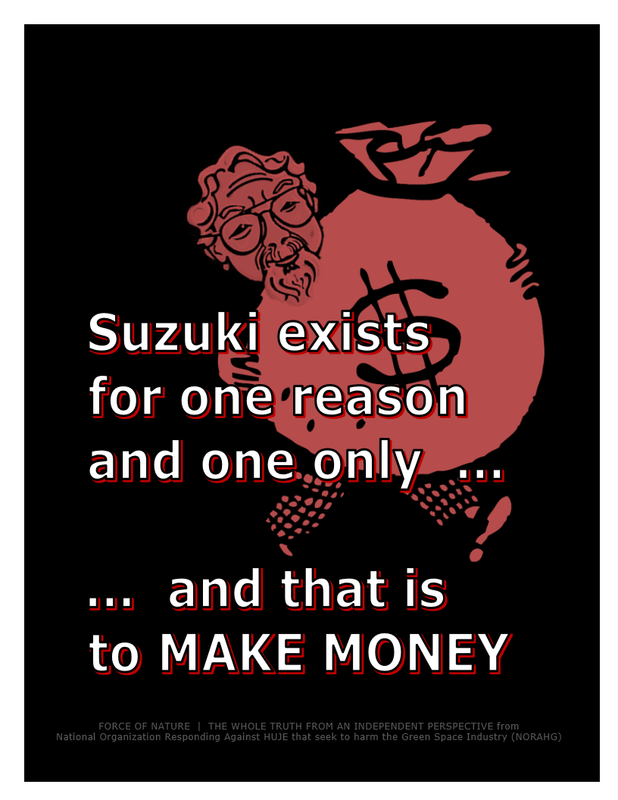 Suzuki exists for one reason, and one reason only … and that is TO MAKE MONEY. David Suzuki Foundation is operated by Enviro-Lunatics who SOLICIT for Enviro-PROFIT by SENDING UNSOLICITED PROPAGANDA PACKAGES TO SCHOOLS AND CHILDREN. 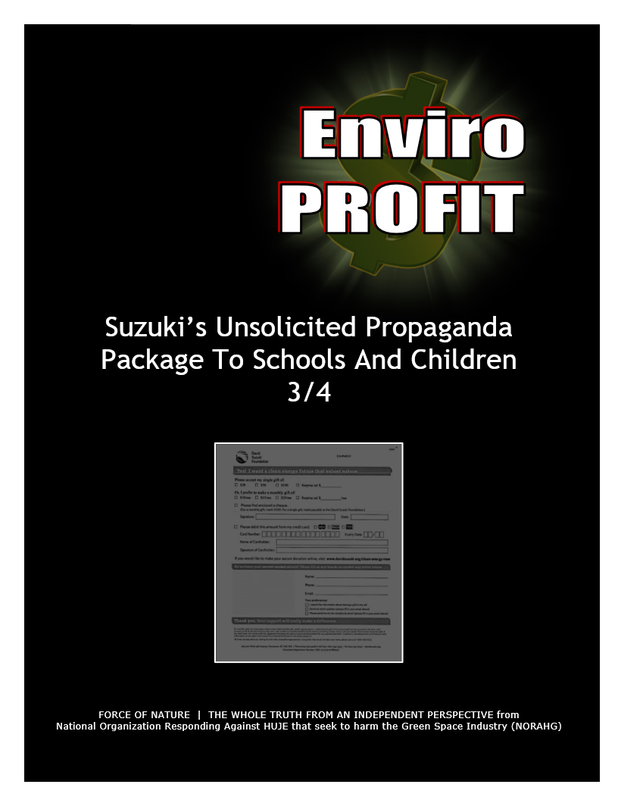 Suzuki DESPICABLY PROSTITUTES FOR Enviro-PROFIT BY EXPLOITING SCHOOLS AND CHILDREN AS WEAPONS OF COERCION AND ULTIMATE TERROR in order to obtain financing through donations. PROFIT AND POWER-HUNGRY organizations like David Suzuki Foundation need more money for LYING AND TERRORIZING ! And Suzuki is, yet again, INTERFERING IN PARTISAN POLITICS, this time FEDERALLY, with statements like « There are serious questions about the federal capacity to safeguard Canada’s environment » and « We are putting all of this [ the environment ] at risk ». 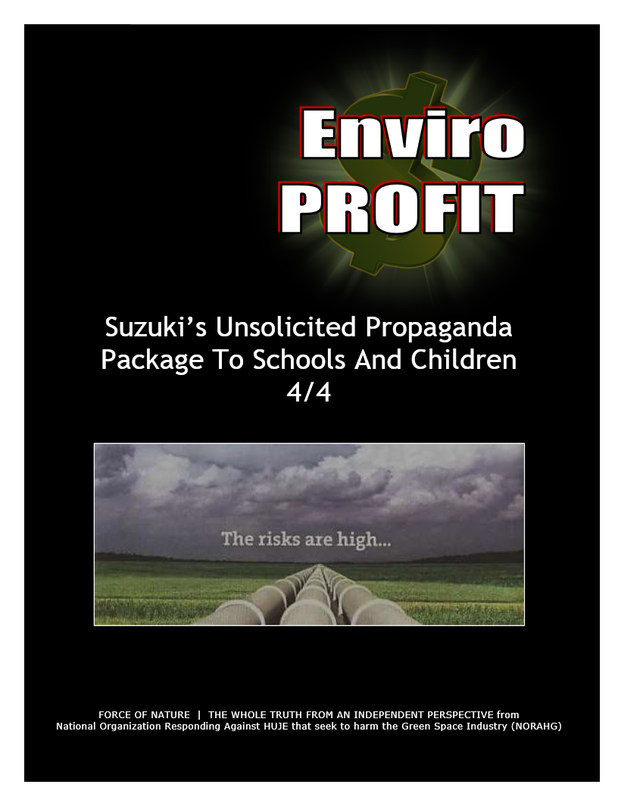 Suzuki’s PROPAGANDA PACKAGES TO SCHOOLS AND CHILDREN are part of the usual CAMPAIGN OF MIS-INFORMATION, FALSE ALLEGATIONS, TOTALLY FALSE RUBBISH, and are UNTRUE MIS-REPRESENTATIONS designed to ALARM AND ENRAGE THE PUBLIC and enhance the CASH-FLOW and ENVIRO-PROFIT of David Suzuki Foundation. Suzuki IS NOT A CREDIBLE SOURCE OF INFORMATION upon which political decisions are made ― Suzuki LIES and LIES and LIES. There is NOT A SINGLE Suzuki-Lunatic-Activist with ANY credible expertise in matters concerning the environment and pest control products. 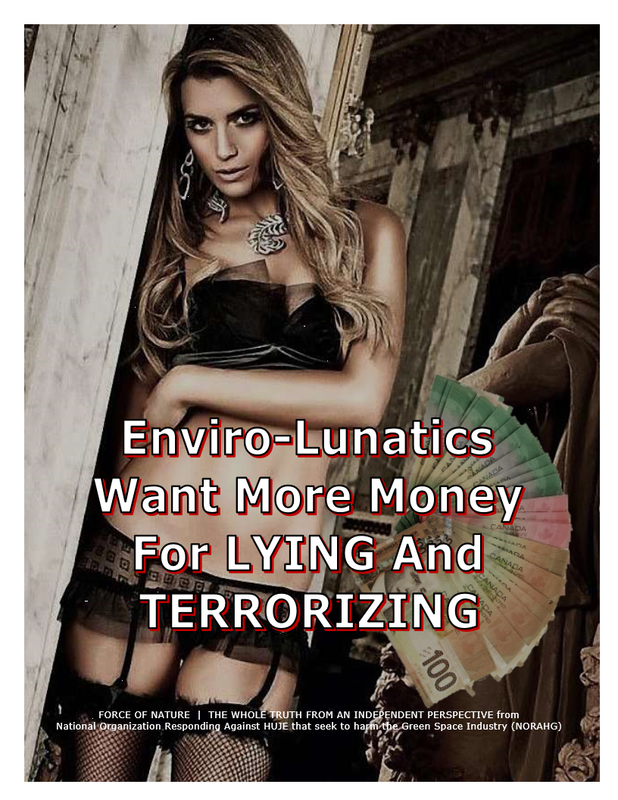 NON-EXPERT Suzuki-Lunatics COMPENSATE for their INCOMPETENCE by becoming COMPULSIVE LIARS, and by RELYING UPON FEAR, INTIMIDATION, COERCION, and TERROR in order to SOLICIT Enviro-PROFIT. 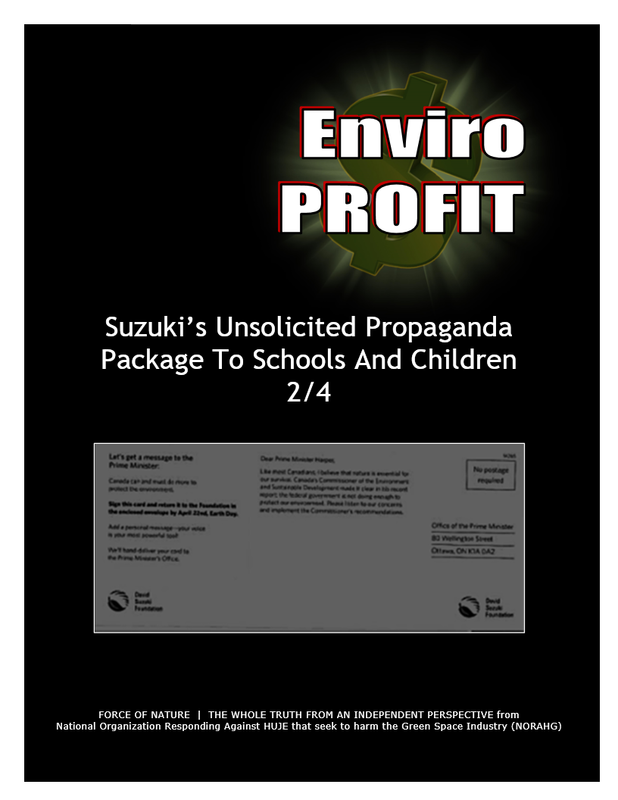 According to Suzuki’s PROPAGANDA PACKAGES TO SCHOOLS AND CHILDREN … If you don’t accept the beliefs of Suzuki, and if you don’t send money to finance Suzuki, then you don’t care about the environment. 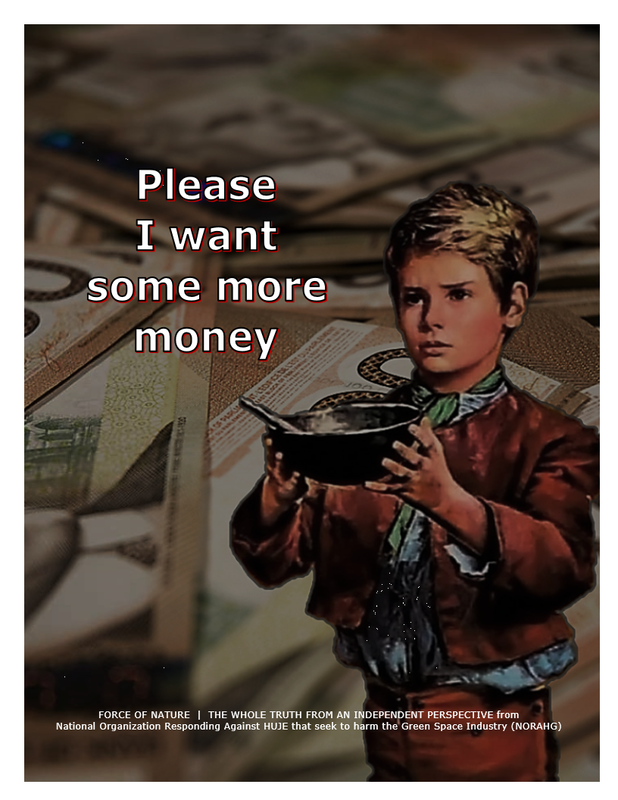 Please, sir, I want some more money. More Money For Lying and Terrorizing ! A practising teacher acquaintance of mine stopped by this morning with a FUND-RAISING LETTER and POST CARD from David Suzuki Foundation. David Suzuki Foundation is sending PROPAGANDA FUND-RAISER LETTERS to schools ( and indirectly teachers or educators ), to ASK FOR DONATIONS. They also expect educators to send a pre-printed POST CARD which they ( David Suzuki Foundation ) will take to Prime Minister Stephen Harper on April 22nd, 2013, Earth Day. In this case, the FUND-RAISING LETTER and POST CARD were SENT TO A PRIVATE SECONDARY SCHOOL, but a school nonetheless. Suggesting, it is likely, that teachers and school administrators working in ALL public and private schools were sent the same package. 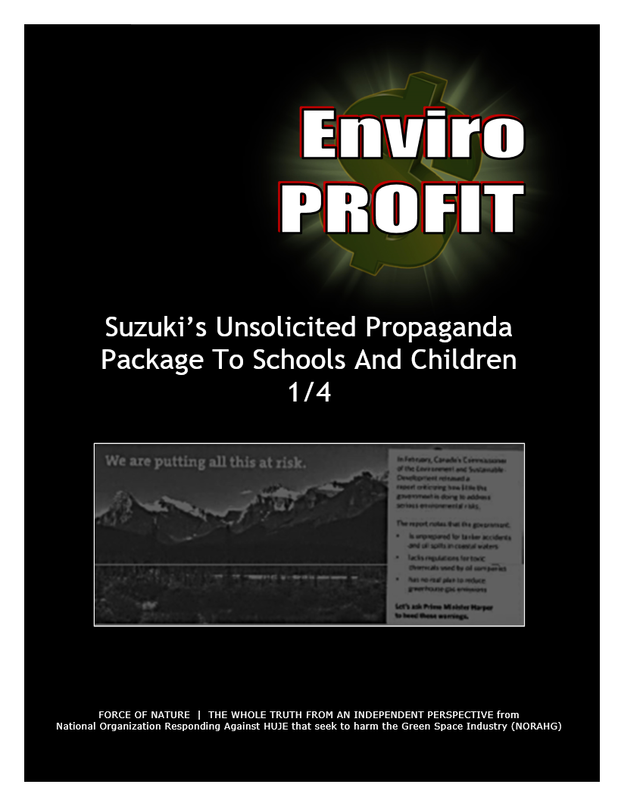 Anyway, whatever Suzuki’s rationale for sending the PROPAGANDA PACKAGE to a school, it was INAPPROPRIATE because Suzuki assumes that anyone not in favour of a carbon tax and oil sands resource development DOES NOT CARE FOR THE ENVIRONMENT. It also assumes that anyone who questions that carbon emissions are responsible for climate change DOES NOT CARE FOR THE ENVIRONMENT. In other words, IF YOU DON’T ACCEPT THE PRECISE BELIEFS held by David Suzuki and Foundation that bears his name, THEN YOU ARE ANTI-ENVIRONMENT. Lots of people are very environmentally conscious but are simply waiting for further proof that the Earth is warming due to man-caused carbon emissions, particularly since there are many different scientific opinions on the topic. For example, the Earth has had many periods of warming and cooling over millions of years and some academics see global warming periods as positive — per this article written by Thomas Gale Moore of the Hoover Institution in 1995 — well before the present-day climate change hysteria norm. Anyway, I am posting this information as a public service because this kind of political correctness and dogma is not only anti-democratic, it also SEEKS TO MANIPULATE CHILDREN indirectly through their teacher librarian or instructional resource teacher ( who usually get mail the school office doesn’t know what to do with ). No one can afford this #@! !% Global Warming NONSENSE. Global Warming was a MYTH, and has been DEBUNKED ! Global Warming was The Scam Of Our Lifetime. In February, Canada’s Commissioner Of The Environment And Sustainable Development released a report criticizing HOW LITTLE THE GOVERNMENT IS DOING TO ADDRESS SERIOUS ENVIRONMENTAL RISKS. The report notes that the government ― is unprepared for tanker accidents and oil spills in coastal waters ― lacks regulations for toxic chemicals used by oil companies ― and has no real plan to reduce greenhouse gas emissions. Let’s ask Prime Minister Harper to heed these warnings. Like most Canadians, I believe that NATURE IS ESSENTIAL FOR OUR SURVIVAL. Canada’s Commissioner Of The Environment And Sustainable Development made it clear in his recent report — the federal government is NOT DOING ENOUGH TO PROTECT OUR ENVIRONMENT. Please listen to our concerns and implement the Commissioner’s recommendations. Sign this card and return it to the Foundation in the enclosed envelope by April 22nd, Earth Day. Add a personal message — your voice is your most powerful tool. We’ll hand-deliver your card to the Prime Minister’s Office. The LETTER is ADDRESSED SPECIFICALLY TO THE SCHOOL. There are serious questions about the federal capacity to safeguard Canada’s environment. You may have seen the headlines last month. Canada’s own independent Commissioner Of The Environment And Sustainable Development, Scott Vaughan, released a detailed report critical of HOW LITTLE THE GOVERNMENT HAS DONE TO ADDRESS THE MANY SERIOUS ENVIRONMENTAL RISKS associated with rapid resource development. Will you help the David Suzuki Foundation continue to speak out for environmental protection by MAKING A GIFT [ I.E. FINANCING SUZUKI WITH DONATION ] OF $20.00. Your DONATION OF $20.00 today will help us continue to demand real action be taken to protect Canada’s environment. Thank you for your support. Sincerely Peter Robinson, CEO, David Suzuki Foundation. The FUND-RAISING FORM is typical for this type of SOLICITATION for Enviro-PROFIT. It has a place to check off a box to indicate the size of your gift. You will recall that the letter asked for a DONATION of $20.00 but the form leaves room for DONATIONS of $50.00, $100.00 or monthly regular gifts. There is also room for your credit card number, phone number, and e-mail address. In other words, this notice is also about adding and maintaining a DATA-BASE FOR FUTURE SOLICITATION. Canada already has dozens, if not more, existing pipe-lines and has had for decades. Moreover, according to Marita Noon her Heartland column, oil will get to the United States one way or the other … and if it is by rail, it is far less environmentally safe than via pipelines. In any event, throughout the Suzuki PROPAGANDA PACKAGE, there are HUGE EXAGGERATIONS, such as suggesting that the Government of Canada, led by the Conservative Party, is doing nothing or very little for the environment, and the Prime Minister, Stephen Harper, doesn’t care about the environment or what was written by Canada’s Commissioner Of The Environment And Sustainable Development. Decide for yourself how true that is. 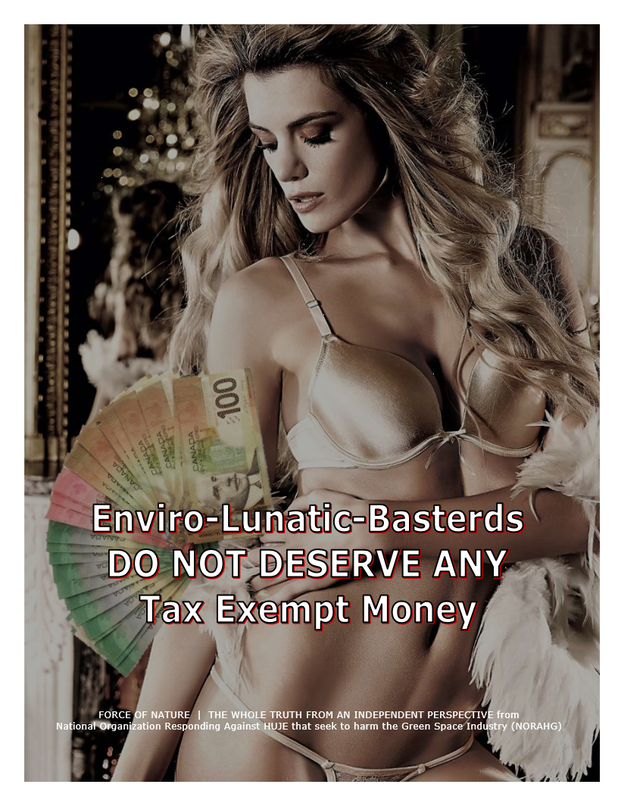 The following segment contains excerpts from the Conservative Party web-site on the environment. Canadian families deserve the cleanest air, water, and environment possible. • $5 million to help protect environmental diversity in the Great Lakes region. Economic Action Plan 2012 builds on the Conservative Government’s impressive record of supporting a cleaner and more sustainable environment. Well, the accomplishments of the Conservative Party may not be worded exactly as the Suzuki Foundation alleges, but the items on the list in the previous segment hardly look like an uncaring government. For example : $1 billion dollars to support pulp and paper mills to reduce greenhouse gas emissions and to become leaders in the production of renewable energy from biomass hardly sounds like Prime Minister Harper is not listening to the concerns of Canadians. In my opinion, the crux of the matter is that the David Suzuki Foundation has LOST ITS CHARITABLE WAY WITH ITS ALL OR NOTHING ENVIRONMENT AND POLITICAL ADVOCACY ABOUT WHAT IS OR IS NOT EVIDENCE OF CARING FOR THE ENVIRONMENT. What Are They For ? … and that is to MAKE MONEY. That is their PRINCIPAL VESTED INTEREST. Anti-Pesticide and Environmental-Terrorist Organizations ALWAYS WANT SOME MORE PROFIT for LYING and TERRORIZING ! The more they CONCOCT IMAGINARY DANGERS, the MORE THEY BECOME RICH ! For example, it is now common-knowledge that THE PRIMARY REASON FOR THE EXISTENCE of organizations like David Suzuki Foundation is BUSINESS, CASH-FLOW, and ENVIRO-PROFIT. It is also common-knowledge that Suzuki’s donation money DOES NOT GO INTO RESEARCH. As with ALL Anti-Pesticide and Environmental-Terrorist Organizations, the VAST MAJORITY OF DONATION MONEY goes to paying for Enviro-Lunatic Hired-Guns or Lobbyists, and clerical employees. And … SUBVERSIVE CONSPIRACIES AND POLITICAL INTERFERENCE THAT SERVE NO USEFUL PURPOSE TO SOCIETY. By late 2012, Suzuki and other organizations SQUANDERED OVER 5,000,000 DOLLARS ON SUBVERSIVE ANTI-PESTICIDE CONSPIRACIES BASED UPON ALLEGATIONS OF UNDISCLOSED, NON-EXISTENT AND UNVERIFIABLE SECRET EVIDENCE about the safety of pest control products. The Government of Canada DOES NOT want its society to continue living in the 9|11 Era of Anti-Pesticide Enviro-Lunatic Profit-Hungry Terrorism, and has LAUNCHED INVESTIGATIONS CONCERNING CHARITY FRAUD AND CONSPIRACY. Force Of Nature ― The Whole Truth From An Independent Perspective. We are living in the DARK AGE OF ANTI PESTICIDE TERRORISM where sound science is trumped by FAKE SCIENTISTS, JUNK SCIENCE and UNVERIFIABLE SECRET EVIDENCE through FABRICATION, INNUENDO, and INTERNET RUMOUR ― scientific research PROVES that pest control products CAUSE NO HARM and can be USED SAFELY. Pesticide Truths and Force Of Nature, in some ways, are like Google for everything concerning the SURVERSIVE ACTIVITIES of Anti-Pesticide and Enviro-Lunatic Terrorists.